Baked Penne - quick and easy weeknight meal. Penne pasta, Italian sausage, onion, bell pepper, spaghetti sauce, cream cheese, mozzarella cheese. SO good! Everyone cleaned their plate!! I was recently challenged by the folks who make Philadelphia Cooking Creme to swap out one of our usual dinner meals with one of their Fresh Family Favorite meals. I have never tried Philly Cooking Creme, so I was definitely up to the challenge! Philly posts new Fresh Family Favorite recipes each month. This month they are featuring Creamy Chicken Florentine, Baked Penne, and Shrimp & Broccoli Fettuccine. I decided on the Baked Penne, since I had everything at the house for it. This dish couldn't have been easier. It was so simple that Chicken Legs said even he could make it. (I might take him up on that next time.) The verdict? Two thumbs up! The cooking creme added a ton of flavor and make the pasta wonderfully creamy. I am already thinking of all the recipes that I could use this in. I can't believe that I waited so long to give the Philadelphia Cooking Creme a try! If you are still on the hunt for a Valentine's Day dinner - give this a try! You won't regret it! Brown meat with vegetables in large nonstick skillet. Stir in spaghetti sauce, 3/4 cup cooking creme and 1/2 cup mozzarella; cook and stir 2 to 3 min. or until mozzarella is melted. Add pasta; mix lightly. Spoon into 2-qt. casserole; top with remaining cooking creme and mozzarella. Cover. Bake 20 min. or until heated through, uncovering after 15 min. Kraft foods is providing the prize for this program at no cost to me. This program is not administered or sponsored by Kraft foods or its affiliates, but solely by Plain Chicken. I am one of 9 bloggers selected by Kraft Foods to participate in the Philadelphia Cooking Creme recipe program. While I have been compensated for my time, my opinions are my own, and I have not been paid to post positive comments. Hello! I love your blog and all of the recipes :). The chicken dumpling casserole is my favorite so far -- I've made it three times! I have tried the Savory Garlic Cooking Creme and made Chicken Florentine with it. Now that they have a Pesto version, I want to try that and make their stuffed shells. I haven't tried the Philadelphia Cooking Creme. The recipe you tried looks pretty darn good but so does the creamy green spaghetti. I think I will try both of those. I like Philadelphia on facebook. I am following Philadelphia on twitter. I also liked the chicken florentine. My favorite of the cooking cremes is the Italian herb and cheese. I use it for alot of recipes. I'm following Philly on twitter. Oh my - anything with cream cheese in is has to be good! I've not tried the cooking cream, but I will definitely be making the Baked Penne. Id also like to try the savory garlic scalloped potatoes and the chicken, broccoli & potato divan. Love your blok and just made the M&M Cakies and the Sausage Cheese Muffins last night! I have used the Philly cream cheese for a potato bake numerous times. Gives a great flavor. Haven't tried it yet, but I would make the shrimp and broccoli fettuccine (all my favorite ingredients!). I have tried this. I had the garlic and herb. I sauteed some shrimp and vegetables and added the sauce near the end. A little white wine to thin it just a tad. It was yummy! Being from the South, I put cream cheese in everything -- especially Philly Cream Cheese, it's my fav and makes everything taste better! I am embarrassed to admit though, I have yet to try this fabulous new product. All of the recipes sound de lish and I don't know which one I want to try first!!! I'm thinking I'm going to start with the Chicken Florentine Casserole though. I am now a follower on Twitter and FB, and look forward to more Philly Cooking Creme recipes! Have yet to try the Creme but looking online, I would love to try Creamy Chicken & Pesto Cavatappi because I love Pesto and I noticed that there's a Creamy Pesto Creme. I have been meaning to try the Cooking Cremes, I am going to try this recipe tonight! I'll follow on FB. I used the Sante Fe flavor and made chikecn enchiladas. They were GREAT! I use this quite a bit and love cooking with Kraft. I made something similar to what you made on your blog with the cooking creme. I didn't use a recipe, just sort of tossed everything together. It was pretty tasty. Your dish looks delicious Steph and while we use lots of their regular cream cheese, we've not tried the Cooking Creme. I would go with the Shrimp & Broccoli Fettuccine to see how it compares with alfredo sauce and I have everything but it on hand. I'll look for it in the market. I've tried the cooking creme in this recipe before and it was delicious! I already like Philadelphia Cream Cheese on facebook! Hi, Steph. The chicken enchilada supreme recipe on the Philly website looks like one I would like to try. Haven't tried the cooking cream yet. Looks interesting. Might be good in your crockpot potato soup (using shredded hashbrowns). Made it twice. Hubby really likes it!! I haven't tried it but would like to! I can see it being an awesome touch in my baked spinach & artichoke dip! I have used cooking cream and love it. I want to try this baked penne recipe also. I love green peppers, so I will most definitely leave them in. I have never tried the cooking cream, but I've always meant to! I'd love to try it on this recipe. I "liked" them on facebook, but I don't have a twitter. I have only used it once so far...I used the Italian Cheese and Garlic with some precooked chicken strips, a little bit of broth, cooked penne and a bag of frozen broccoli, cauliflower and carrot mix. It was delicious and super quick and easy. The penne and the chicken strips were leftovers and I love the cream for use of leftovers since my daughter usually turns her nose up at leftovers...it was great to turn it into something completely new. I have tried Philadelphia Cooking Cremes in my casserole dishes, they're delicious! They make all my casseroles dishes extra creamy! I haven't tried the cooking creme yet, but I plan to. I think this recipe (Baked Penne) might be the first one I try. It looks/sounds wonderful! I haven't seen the Cooking Creme in the stores yet but will start looking. The baked pasta will probably be my first recipe to try - yummm! I followed Philly on Twitter (Teresa_H). I liked the Philly Facebook page. I would make the Savory Garlic Scalloped Potatoes. Yum! I have used the Philly cooking creme in a manicotti dish, and it was yummo!! I will have to try your recipe as well! I definitely want to try the recipe for Tortellini in Creamy Rosé Sauce. I have not tried the cooking cream before, but I am sure my husband and I would love the pesto flavor. I haven't tried it yet. I guess I'd choose the pesto stuffed shells from the Philly website, but I really wanna make your baked penne recipe here, it looks Delish!!! I have never tried it, but being a cheese lover, I surely will! I looked at the recipes and the Shrimp & Broccoli Fettuccine looks like the first recipe I would like to try. Thanks for the giveaway! I LIKED Philadelphia on Facebook. Thanks again! Love this site & this product. We use primarily the Italian Cheese & Herb, it always gives a nice creamness to the recipes. I have never tried the Philedelphia Cooking Cream but as I was looking through the recipes on cookphilly.com I came across the Ceaser-Chicken Salad Panini. That sandwich looks really good so I think I will try it! I love using my panini press, although I don't use it as often as I like. So what a better reason to break it out and try this recipe! Thank you Kraft for making the Cooking Creme! I never remember to leave out regular cream cheese to warm up and end up microwaving it. What a mess! Cooking Creme is so easy and the consistency is so much better too. This is the perfect creation for a busy mom! I love the Philly cooking Creams. We use it for leftovers. Add leftover chicken, noodles and the cream, heat it up and enjoy. The kids don't complain about eating leftovers this way. I haven't tried it yet, but I want to! Especially after seeing recipes like this. I also would like to try the Baked Chicken Enchiladas! YUM. That looks yummy! I have used it in a recipe, one I found online for pasta and sauce but it wasn't baked. I do love baked penne, I will give this one a try soon. 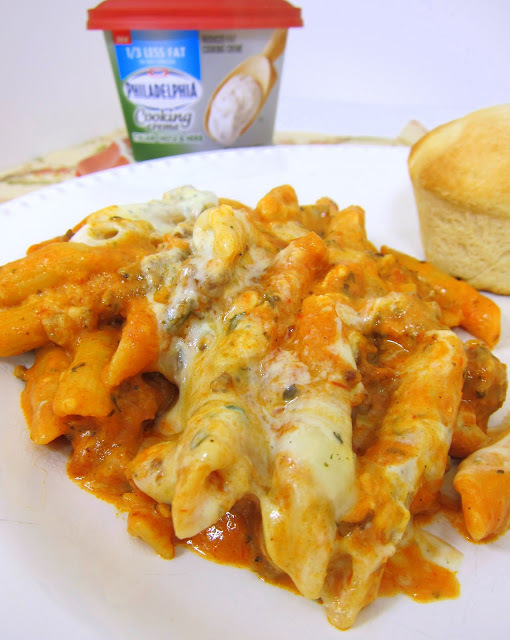 Definitely the Creamy Pesto Baked Ziti - I haven't tried any of the cooing cremes yet, but I plan to! Thanks for the giveaway! I also liked Philadelphia on facebook! This recipe sounds and looks delicious and easy. I LOVE using Phildelphia Cooking Creme in my kitchen. It adds so much flavor & creaminess and my family loves eating it! I have tried the cooking creme and liked it. We tried the Italian Herb and cheese version and made a pasta dish with it. My favorite is the Savory Garlic! It is very tasty and makes a great quick meal. Also, I liked it on Facebook! And I "liked" Philadelphia on Facebook. I haven't tried it cause I've been dieting. But, since I see that reduced fat on the label will definately give it a whirl now. I've tried their sauces a couple of times and love how easy it is to turn a so-so dish into a "special" one with their creamy sauces! I've tried the Italian herb one and used it in a chicken dish. Very good. I love the Philadelphia Cooking Creme line. I have made stuffed sweet peppers with their Santa Fe creme and ground sausage mixed in. Delicious! I have added the Philadelphia CC to other recipes and love to use the garlic flavored in the "Creamed Spinach" recipes! It is to die for! Top with some fresh parmesan cheese, bake and what a wonderful side dish! And easy! I've never tried it, but I'd like to try making the Chicken and Broccoli Cheddar skillet! YUM! I liked Philadelphia CC on Facebook! I followed @LoveMyPhilly on Twitter!! It caught my eye in the store recently and I have been thinking about trying it. Thanks for a review I can trust. I think I would try the grilled chicken flat-bread recipe. I have made lasagna with Philly cooking creme... I usually put cream cheese in mine and I used the Italian cooking creme instead. It was great! I think that baked penne sounds delicious and so simple! I want to give it a try RIGHT now! I want to make the penne that you made. In fact, I just forwarded this my husband in hopes that he would pick up the ingredients for dinner. Yummy! Thanks for the chance to win. I tried Philadelphia cooking creme a while back in a pasta dish with white sauce. It was OK but I really like the way it looks in your red sauce pasta dish. I have not tried the cooking creme, but looking at the website, I'd try the Todd English creamy italian mac and cheese. hmm I haven't tried it but the chicken and pesto cavatappi sounds wonderful! I've used the Santa Fe kind, mixed with chopped chicken, as a nacho-type dip! yum. I LOVE all the cooking cremes, but am UBER EXCITED!! about Kraft coming out with a 1/3 less fat versions!! I use the sauces all the time. A couple of spoonfuls in scrambled eggs - AMAZING!! Not just for dinner anymore. :-) Hope I win!! Shrimp & Broccoli Fettuccine looks divine! As soon as I find the cooking creme, that will be in the rotation. I have tried it in a few recipes. I made a calzone once and I thought it was too salty. But I made 1 similar to this (maybe the same) and I liked it. Liked Phili Cooking Cream on Facebook and found out about CHOCOLATE CREME!!! OH MY GOSH!!! I just passed out! I love the Philly Cooking Creme! I like using it in my alfredo sauce. I've also used the southwest flavored creme in my taco lasagna, delicious! I tried it first in place of sour cream in stroganoff and it was delicious! So far though, I LOVED a couple spoonfuls in a breakfast scramble... delicious! i'd like to try the sante fe chicken casserole! I have tried the cooking creme many times and we really like it! I have used the Santa Fe cream to make a pasta dish from the website...it was really good!! I have tried the cooking cream, but it didn't turn out well. I need to try a recipe that KRaft recommends and then maybe it would work out better. I haven't had the pleasure of trying the Philadelphia Cooking Creme, but the recipe that looks the most intriguing is the Santa Fe Chicken Casserole. I have also "like" on Facebook and followed on twitter. I have tried it...I made some pasta and mixed it in. Really good stuff. I like Philidelphia on FB. I've used it a few times...I love it! Just last night I made the chicken pot pie recipe - so good! tried the savory garlic and used the recipe on the back of the container. I haven't tried any recipeds yet but I would love to try the Creamy Chicken Picatta with Asparagus, yum! Also I liked on facebook (no twitter here) and my e-mail address is lrandazzo@hotmail.com! Love your blog, I've tried tons of recipes in the short time that I've been following. I haven't tried the Philly Cooking Cream yet, but plan to make the Baked Penne this week with some! I have not tried it yet, but I would love to try the Grilled Chicken Flat bread recipe! Looks delish! I "Like" Philly cream cheese on Facebook! I follow philly cream cheese on Twitter! I can not wait to try this recipe using the new Philly cooking creme. I have seen these in the super market and have been waiting to try them. Looks like dinner! I haven't tried the cooking creme yet, but your recipe looks delicious! I can't wait to try it! Steph your penne looks so creamy and cheesey and wonderful! I have used Philadelpia's Southwest cooking sauce in a baked macaroni and cheese with Chorizo. You're so right about teir sauces making it easier to get dinner on the table. I "Liked" them on Fb. I am following them on Twitter. I haven't tried it yet, but would love to try the creamy pesto stuffed shells! The Pesto Bruchetta spread looks oh-so-yummy! i want to try the creamy pesto stuffed shells! you can never have too many good pasta recipes! I think it would be great as a layer in a veggie Lasagna. I have not tried the Cooking Creme yet, but this Baked Penne sure looks delicious!! I also like the looks of the Shrimp and Broccoli Florentine! I must give them a try! I "liked" Philly Cream Cheese on Facebook! I am now following them on Twitter too!! I both liked Philly on facebook and followed them on twitter. I just used the original cooking cream last night! Our favorite recipe is the lemon broccoli chicken but now I can't wait to try the baked penne and the shrimp & broccoli fettuccine . Like Philly Cream Cheese on FB. I have tried the Santa Fe/Mexican inspired cooking creme. Both times I used it I made a Pasta dish (from their site) using corn and rotel. Delicious! I haven't tried any of the other flavors, but this recipe is now on my list! I haven't tried this yet, but putting their Savory Garlic cream cheese into the scalloped potatoes sure looks like something my family would love! I love your blog! Decided I had to follow it after finding 3 recipes in a row on pinterest that made my mouth water (and actually turned out tasty!). I've used Philly Cooking Creme before and it's really easy to keep on hand for a quick dinner. I just kinda make it up as I go. I want to try this recipe! I use the santa fe kind to make enchiladas - it makes them so creamy! I made very easy chicken enchiladas with the garlic cooking cream. I mixed leftover chicken, the cooking cream, and a can of diced green chilis. I used this to stuff the flour tortillas, sprinkled in some cheese, and rolled the up. I poured green enchilada sauce over them, more cheese and baked at 350 for 30 min. My sons and husband loved them! I'm glad to see the lower fat version out! I'd honestly like to try any recipe! I'm looking forward to this baked penne. It will be on my menu next month! I have not tried the cooking cremes but that Mediterranean Chicken and Vegetable Rotini looks like it will be my first choice! I've tried the cooking creme before, pretty good stuff! I'm REALLY excited they have 1/3 less fat now, that will be much better to use! I posted just above, I also liked them on facebook! ...annnnnd I am following them on twitter now!! I love these! They are so easy to use and taste awesome. I have used them for Mac and Cheese and Bacon Dip and just a ton of stuff. I am also following on Twitter and FB. I've tried all of them. I was not impressed with the Italian Herb and Cheese. I've made the enchiladas with the Santa Fe blend. I've also used it warmed up just as a dip for chips. I used the Savory garlic in your cream cheese spaghetti bake and just last week I spread it on chicken and wrapped in bacon. So yummy! <3 Philly Cooking Cream! Have used it plain on chicken, pork, beef, and even in the crockpot! So versatile and YUMMY!! I'd love to try the Creamy Shrimp Tacos! I liked Philly on FB! I also follow Philly on Twitter! I usually add cream cheese to my potato soup. Now I also add cooking cream. Change up the flavor....garlic, Santa Fe or Italian...and it changes up the flavor of your potato soup. It also makes a great baked potato topper. I love Philadelphia Cooking Creme! I am a fan of Philadelphia on facebook. I love your blog!! Found on pinterest and now i check in daily! I tried the philly cooking creme italian herbs. I used chicken breast tenders and mixed the cooking creme and cream of chicken soup. It was awesome! My fiance, who is very picky, ate 3 helpings! It was awesome and i will certainly use it again! I also like them and follow them on twitter!! I have never tried the cooking cremes. I would like to try the Denver-Style Breakfast Burritos!! Another Stephanie here! Love your blog and fantasize about your recipes EVERY DAY... I just don't understand how you stay so thin!!! Anyway, I have used the cooking creme in mashed potatoes instead of milk... makes for some tasty taters! I had never heard of this stuff before! Wow, the possibilities!! I think I would try the Chicken Florentine, although your Penne recipe looks fabulous too! We made baked cream cheese spaghetti using the italian herbs philadelphia cream cheese! It was amazing! I followed Philadelphia on twitter. Have not yet tried cooking creme but looks like I have a reason to now! I liked Philadelphia on FB! I'm following Philadelphia on Twitter!! I bought some of the savoury garlic on Saturday - I can't wait to try it! I'm going to make your penne recipe for supper tomorrow. I would like to try the Savory Garlic Scalloped Potatoes! I'd love to try the chicken piccata & asparagus! simplyabeck@gmail dot com.